Image caption Manchester Royal Infirmary was rated as "requiring improvement"
Eight out of nine hospitals in a newly formed Greater Manchester health trust have been rated as "outstanding" or "good" in its first inspection. The Care Quality Commission gave Manchester University NHS Foundation Trust a "good" overall rating after visits in October and November. 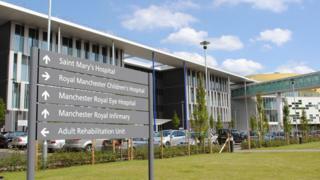 Manchester Royal Eye Hospital was the first dedicated eye hospital in the UK to receive "outstanding" status. Manchester Royal Infirmary was deemed as "requiring improvement", however. Inspectors highlighted concerns with surgery, with some equipment being "visibly dirty". Inconsistent infection control practices in theatres were also discovered. And patients could not always access timely treatment, particularly in the emergency department. Chief Inspector of Hospitals Prof Ted Baker said those issues needed to be addressed as a "priority". Sorry, your browser is unable to display this content. Please upgrade to a more recent browser. MFT was set up in October 2017 after Central Manchester University Hospital NHS Foundation Trust and the University Hospital of South Manchester NHS Foundation Trust merged. Mr Baker said: "Overall, we found a high standard of care across the organisation. "Inspectors saw many areas of outstanding practice across the trust." The University Dental Hospital of Manchester joined the Manchester Royal Eye Hospital in being rated as "outstanding". Mr Baker also highlighted the work of the community child and adolescent mental health services and adult critical care services. MFT chief executive Sir Michael Deegan said: "As the largest NHS trust in the country and a leading provider of specialist healthcare services, this 'good' rating provides our patients with significant assurance about the quality of care they can expect to receive." Achieving the 'good' rating so soon after the merger was a "significant achievement and testament to the dedication of staff", he added. However, the trust added: "As with any inspection, the CQC identified a number of areas where [it] needs to make improvements and the trust will be focussing on these in the coming months ahead."